Oh, an Illustration Friday, up on Friday, that must mean I'm pulling things from the old files! This was a piece I did for a small Christian kids magazine for their April issue. It's looking a little out of season now, but with the weather in the 90's everyday, it still feels like summer here. Yuck! This week's theme is, "float" and here we have frogs floating on lily pads and in the air. I'm working on a new fall banner for the ol' blog. Things I miss about fall time up north: crisp breezes, scarves, the smell of wood burning stoves, the colors of the leaves, fuzzy wool sweaters, goose bumps because it's actually cold, seeing the kids where winter coats over their Halloween costumes, hot cocoa and caramel apples. (Of course, I could have those now, but it's just not the same.) Off to create. Enjoy your weekend and send your cold weather to me! Speaking of which, my bead site has just gone under major changes. New logo, new images, new products, new shopping cart! I want to add a press page, a gallery and a jewelry boutique, but the beads section is finished for now. Why all the sprucing up? Well, my national television debut of course. My episode of HGTV's That's Clever (formerly Crafter's Coast to Coast) will air October, 28th. I will be acting like a complete goof, so tune in for the fun! Ta-da, some of my first felted beads. They are so easy to make, you won't believe it until you try it! Here are the instructions. I didn't use the ice water, just hot soapy water and my hands. I like some more than others, but they have all been fun. 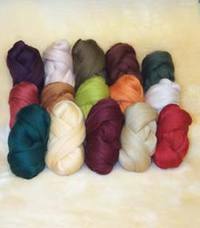 I ordered an earthtone set of roving (carded wool) from Outback Fibers, I wish I had ordered some brighter colors. I may have to take a trip to the Yarn Barn and see if they have some nice colors. I'd like to see the shades in person to pick them out, it's hard to tell from the computer. Or maybe after a few more bead sales this week, I'll treat myself to the big pack of all the colors from Outback. I highly recommend Outback Fibers, the owner was super friendly and helpful and my order arrived in lightening fast speed! My next attempt will be dry felting with a felting needle. Oh and the seed beads are just sewn on with a beading needle and nymo thread. Can't wait to whip up some more tomorrow. I think I'm going to use them in leafy bracelets for the fall. If you make some beads, put the link in the comments section, I'd love to see what you come up with! About a month ago while out thrift store shopping, I ran across a set of cards with vintage children's book illustrations on them and comforting little quotes on the back of each one. They are called Sweet Dreams Cards , by Cooper Edens and Sheryl Abrams. You are suppose to read them to your wee ones at night and tuck it under their pillow as a bedtime ritual. I just love the illustrations and bought them for myself! Where it will lead: hopefully to living our dream of being at home in the sleepy little town on Lake Michigan, working as artists. I keep telling myself, that even though there aren't many opportunities for artists in that town, for goodness sakes, it's 2 hours from Chicago. The whole world is just a quick drive down the road. I miss everyone back home. Mom, enjoy the sunsets this week for me, make sure to get your feet wet and look around for a piece of beach glass or two. Yesterday was another Artist's Day Retreat with Linda Dessau. She a creativity coach that I've been working with and she's so sweet and helpful. I love the artist day because it's a time to give myself permission to play and to be introspective about what I'd like to do with my art. I've been working with Linda on starting a system to help me become more productive. Sometimes I feel a little silly needing a coach, but my life is pretty much out of control and it helps to have an objective person to point out where you could make things easier. This bracelet is a present to my most creative self. One of the exercises available through Linda's coaching is meeting your most creative self in the future and having a conversation. Normally, I'd balk at anything like that, but I gave it a try. While imagining who I'd like to be as my most creative self, fall time and the colors of fall were very dominate. I imagined Jesse and I living in my favorite spot on earth, a little beach house next to the dunes where we spent our first summer together. It was fall time, my favorite time of year in Michigan. And what sage advice did my most creative self give me? What was the one thing that I needed to do to create my most creative life? Stop worrying and spend that energy creating. Simple enough, but I love to worry, so it's been a challenge, but I feel like I'm on the right track. How much time and and energy do I spend worrying, a lot. What could I accomplish during that time, if I just let things go and focused on the task at hand, a lot! The leaves and clasp of the bracelet were taken from a new book I treated myself to, Creative Beading , by Juju Vail. The clasp is a flower that has a bead through it. I love that! Click on it to see it up close. Felt beadmaking, okay that will be a few days, but it's so on my brain today! I ordered this batch of carded wool today from here. Oh, so pretty. I want to make tiny felt acorn beads with the little cap part beaded in tiny seed beads. I don't know what you call the top of the acorn that looks like a hat, but that's the part that will be beaded. I also thought about doing the top in precious metal clay, they have the clay in a liquid form that you can paint on, hmm, I may have to order some of that too. I can't wait to play. Here are my two muses for felt beads: Gail Crosman Moore and JuJu Vail. This weekend will also have me working on a little knitting on a purple wrap that I'm making for myself. A free-form peyote stitch bracelet inspired by the colors of fall. Artist's cards and a journal I want to make and a swap with a follow blogger. I think that should just about cover the next 72 hours! Do you know any good places to get carded wool for felting? Leave me a comment with a link if you do! This is my entry for illustration friday. It's a handpainted block print. I had been working on a series of drawings that had the theme of houses, roots and seeds to symbolize that we are all provided with everything we need. This week has been hard to deal with, of course, my heart goes out to those whose suffering we can't even begin to imagine. But my heart has been heavy for my parents. Who have been displaced by the storm. They live in Jefferson Parish. Their home was not flooded, but their lives will be changed forever. They were on vacation visiting family in Michigan when the storm hit. They are safe and well cared for and I am so thankful. Uncertainity and fear will eat us away if we let it, draw strength from your roots, from your family, your faith and those inner seeds of greatness that lie within. Everyone does according to what their heart tells them. I have put up an auction for the Red Cross for an artist's journal that I made with this image. If you'd like to have an original piece of my artwork and support a good cause, click here. Here is a pendant I made using one of my Monet beads. Just thought I'd share. It's a new month already. It's my sister Jessi's birthday. Happy day sis! This month, I want to get this list done. I'm so, so tired of having the same things here every month. Finish outline for Bead Studio book, submit querry to Lark Books. Send out article to Step by Step Beads. Send tearsheets to a few magazines that I'd like to work with. Put together small packets to send out to 5 galleries. Finish a few fancy necklaces to submit to Lark Book necklace competition. Work on my dummy book every friday. Okay, this is along with filling orders and selling on ebay. Which is going great, I have to say! Now the hard part, actually doing this work and not getting side tracked on projects that waste my time.